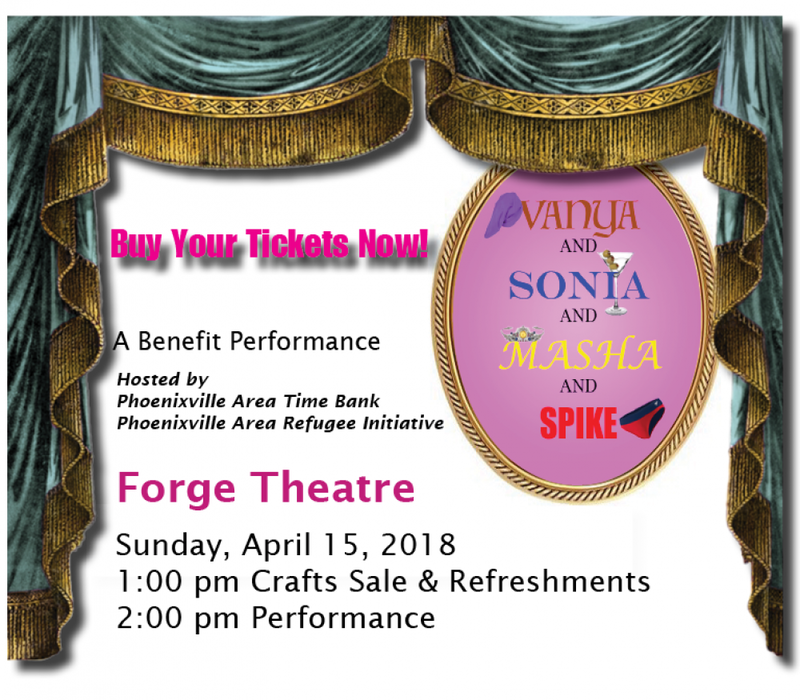 Phoenixville Area Time Bank (PATB) has booked a special performance of the Forge Theatre production of Christopher Durang’s hilarious 2013 Tony Award-winning play Vanya and Sonia and Masha and Spike on Sunday, April 15th. Proceeds will benefit PATB and their newest partner, Phoenixville Area Refugee Initiative (PARI). Playbill’s synopsis of the play reads as follows: Vanya and Sonia have never left the confines of their childhood home in Bucks County, PA, while their sister Masha has been gallivanting around the world as a successful actress. A surprise visit from Masha and her 20-something boy toy, Spike, throws the normally quiet household into utter upheaval as its residents and visitors get swept up in an intoxicating mixture of lust, rivalry, regret, and the sudden possibility of escape. 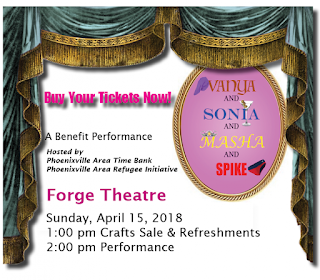 Phoenixville's Forge Theatre, located at 241 1st Ave, is a wonderful live-performance venue presenting local talent in an intimate setting. Prior to the 2 p.m. performance, doors will open at 1 pm., allowing attendees to enjoy tasty refreshments as well as view and purchase a variety of eye-catching crafts, created and donated by talented members and friends of PARI and PATB. All are encouraged to attend and bring family and friends (advisedly over 12 years of age). After the show, there will be a "meet and greet" of the cast, PARI and PATB committee members, and fundraising sponsors. Tickets are $25/individual and $18/person for a group of 6. ON SALE NOW on EventBrite.com. PARI is a coalition of diverse individuals who have come together to learn about and support refugees. Its goal is to welcome a refugee family into the Phoenixville area and to help foster that family to independence in their new home. Currently, PATB is the fiduciary umbrella for PARI. Since its 2004 founding, PATB has been creating a responsive, connected community that uses time as currency while serving each other in “neighbor-to-neighbor” exchanges, with an emphasis on helping elders, convalescents, the unemployed, and people with disabilities. Time Bank members offer help in a variety of ways, e.g. : pet sitting, cooking meals, editing, running errands, child care, and home repairs. Activity groups and monthly socials connect members as well.